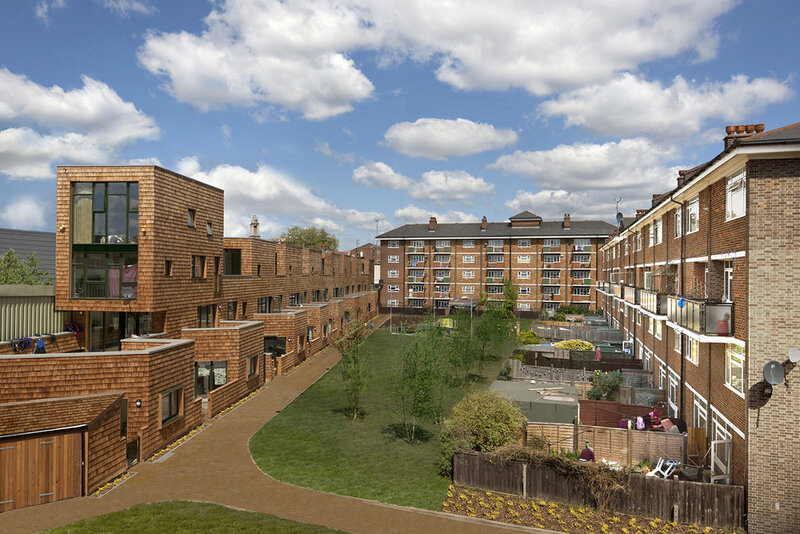 Beveridge Mews is a row of 8 new terraced houses and a new community garden located within the Stepney Green Estate in Tower Hamlets East London. It is 100% affordable housing. Tower Hamlets has a high level of poverty and a high demand for social housing. There is under provision of housing for extended and multi-generational families in the Borough and a significant problem of overcrowding within individual homes. Beveridge Mews seeks to directly address this problem by providing individual houses which range in size from 4 to 6 bedrooms designed to accommodate large, multi-generational families. Priority was given to families who were currently experiencing problems as a consequence of occupying overcrowded accommodation elsewhere on the Estate. 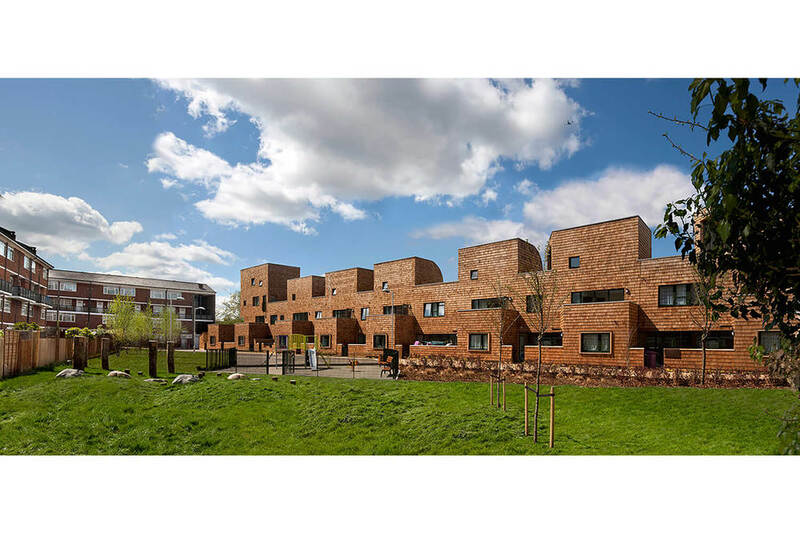 The project is configured as a thin notched terrace stretched out along the west side of the site to create a backdrop to a beautiful new community garden and playground enclosed in the three remaining sides by existing estate housing. 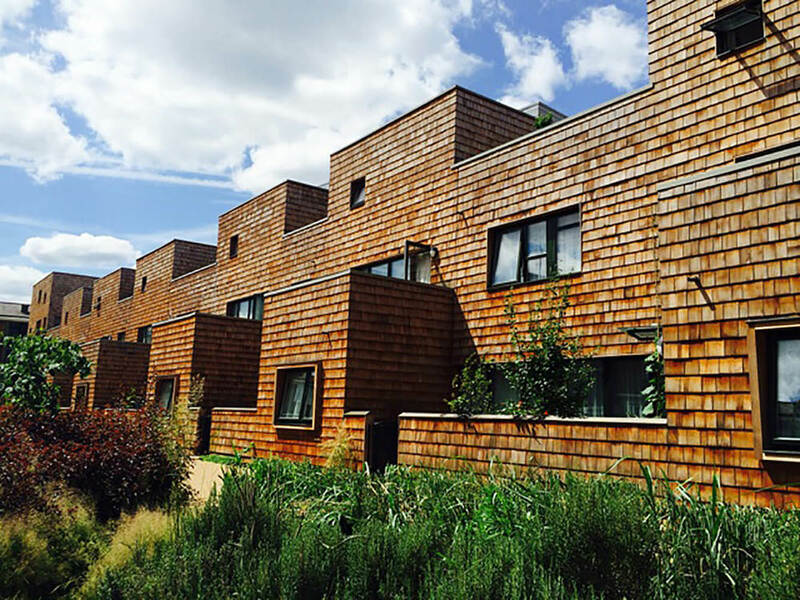 The new row of houses is made of timber shingles which references the make do and mend aesthetic of the existing sheds and patchwork garden fences of the building opposite. Our buildings complex stepped profile is designed to provide sunny spots for people to hang out and do stuff. Peter Barber Architects worked closely with the client to ensure the social ambitions of the design were retained throughout. Already we’ve seen a little outdoor gym, a whirly gig, bikes being fixed, a sun lounger, and tomatoes plants. Just what we’d hoped.